During peeling operations, bars from various steel materials are given their required surface quality, dimensional accuracyand roundness. 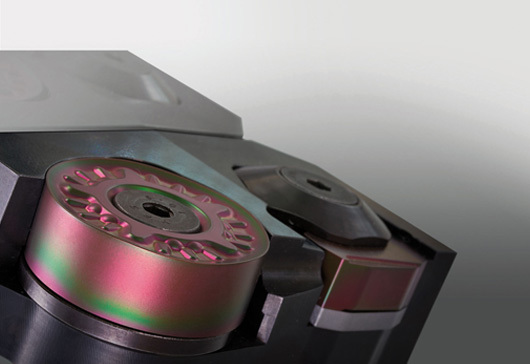 For all material classes and diameter ranges, as well as cylindrical and tapered machining, we offer numerous insert styles in a variety of geometries and carbide grades, customised tools and comprehensive solutions for improvements to both quality and productivity. The continuous development of production technologies is one of CERATIZIT's highest priorities: for example, the new COLORSTARTM coating is made up of a multilayer aluminium oxide structure, exhibiting very fine crystals and making the colour of the inserts appear green and red. On the one hand, improved mechanical properties are achieved thanks to this fine, crystalline structure, while on the otherhand, reducing the overall roughness of the layer, resulting in an optimal chip evacuation. This in turn reduces frictional contact and causes minimal heating of the cutting material.